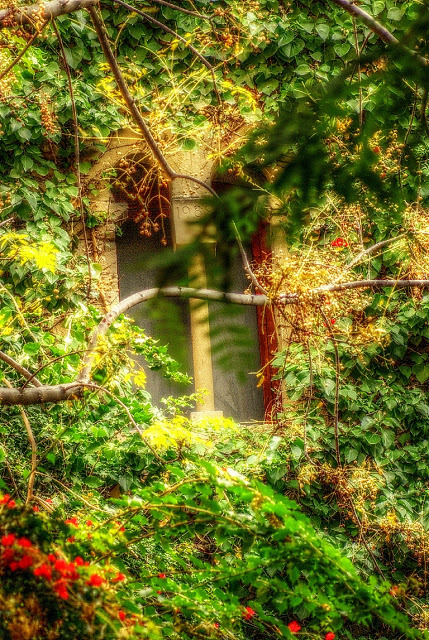 Someone’s window to a secret garden in the old town. This entry was posted on June 30, 2011 by robthefrog. It was filed under Barri Gotic, colors, old town, theme days . What a wonderful promise. May the doors ahead of you two always lead to such happiness as this picture seems to be filled with. Beautiful! A secret garden is the best kind. Very artistic shot Rob, I love the green! I wonder what one would find behind that secret window…. Interesting GREEN post for theme day, Rob! BTW, it was 37 degrees Celsius here in Eagan both yesterday and today! It's like a tapestry! The different greens and yellows and browns are all woven together. Excellent capture and what a find! I love little hidden doors into gardens such as this. A magical place. So perfect for today's theme. I agree with both Julies – there's a novel here somewhere. That house is nearly weighed down with greenery, Rob. The masonry must be nearly sucked dry. There is an old (really old) English children's novel called 'The Secret Garden'. This could be it! A place to relax and dream. Very lovely play with the green ! Oh that looks very mysterious, wonder how long that garden has been growing over like that, maybe since 1989? What beautiful colours, personally I love an overgrown to a precise look garden. Must be my 'wild' side haha! !